Kerala Public Service Commission (KPSC) has released the Civil Excise Officer Trainee Short list 2018 for Thiruvananthapuram district. The KPSC candidates who have written the Civil Excise Officer Trainee Exam (Category 340/2016) can check PSC short list from the web site. short list is prepared on the basis of the scores obtained in the Objective type test conducted by PSC. 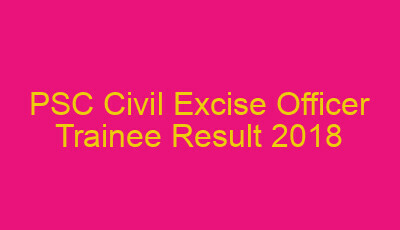 PSC now published Civil Excise Officer Trainee Short list Thiruvananthapuram district. The candidates who have scored 56 marks and above are included in the main list. The candidates included in the Short List should present and produce in person with Original documents for Verification. Date, Time and Venue of Endurance test ,Physical Measurement and Physical Efficiency test, Certificate Verification will be intimated to the candidates through their Profile, Telephone messages, Electronics and Print media. The candidates can check the Excise Officer Short list Thiruvananthapuram district from the official web site of Kerala Public Service Commission www.keralapsc.gov.in. The PSC has already published Civil Excise Officer Short list for Thiruvananthapuram district. PSC will be publishing the short list of other districts very soon.